Little Bit of Heaven Cherokee Cabin is a very private secluded cabin at the top of the mountain. It has a paved private driveway that is easily accessible by car, SUV, motorcycles, and even trucks with trailers and dead ends at the cabin. The cabin is a three bedrooms, three bath with fully equipped kitchen. Also has two wide screen TV's with DirecTV connection and high speed wireless internet service. Little Bit of Heaven Cherokee Cabin is a very private secluded cabin at the top of the mountain. It has a paved private driveway that is easily accessible by car, SUV, motorcycles, and even trucks with trailers and dead ends at the cabin. Enjoy views of the Great Smoky Mountains and the valley below from the rocking chairs on the covered front porch. The cabin and property borders the Sequoyah National Golf Course thru a forest area. Wireless Internet service is free with cabin rental. Located three miles from Harrah's Casino in Cherokee and the Blue Ridge Parkway, three miles from the Smoky Mountains Country Club Golf Course and eight miles from the Great Smoky Mountain Railway Station in Historic Dillsboro where you will find unique shops, galleries, collectables, and crafts. Also three miles to grocery store, restaurants, and fast food. Only ten minutes to Maggie Valley or Bryson City and twenty minutes to Rafting and Tubing in the Nantahala Gorge with numerous hiking and biking trails throughout the area. Multitudes of recreation and entertainment along with waterfalls nearby. Hike into the mountains and commune with nature, float the many rivers and streams on tubes or rafts, or visit local area flea markets. 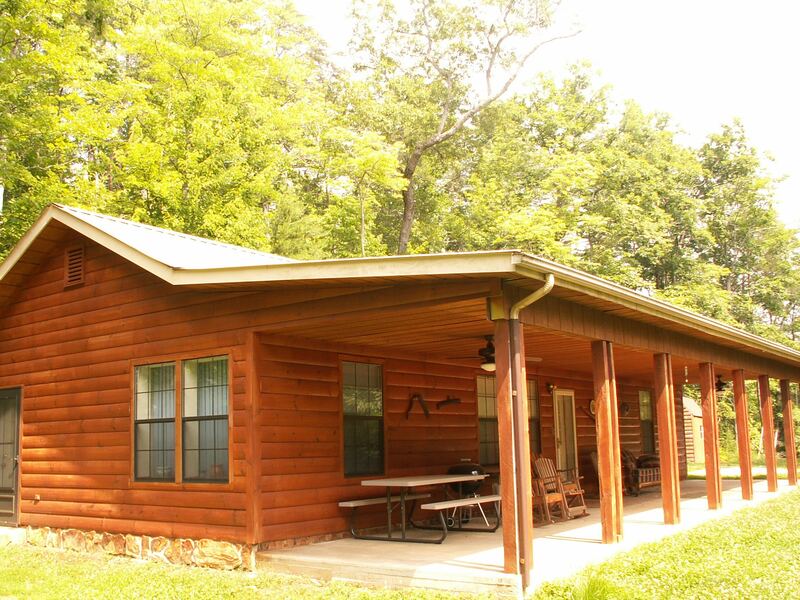 Enter from the covered porch into the fully furnished cabin with Central Heat and Air Conditioning. Three private bedrooms (Two Master Bedrooms) with one king bed, one queen bed, three double beds, a sleeper sofa and a sleeper love seat. On rainy or snowy days enjoy the big game or movie on the large flat screen satellite HDTV with DVD/VCR player in the living room or watch a movie in the bedroom on the large flat screen satellite smart HDTV and Blu-ray player.